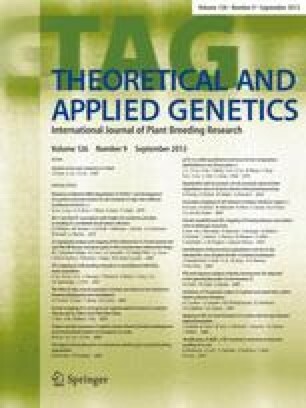 Molecular markers were used to investigate phylogenetic relationships among the eight species of ryegrass (Lolium) and 11 species of fescue (Festuca). RAPD and RFLP analyses were carried out on total bulked DNA from each population. Factorial analysis of a phenetic distance matrix yielded three major groups: (1) fine-leaved fescues, (2) broad-leaved fescues and (3) ryegrasses. Six non-coding regions of chloroplastic DNA were PCR-amplified, then digested by 20 restriction enzymes. Nuclear rDNA sequences, including internal transcribed spacers (ITSs) were used to estimate the average proportion of nucleotide substitutions. The correlation between substitution rate estimated from ITS sequences and that estimated from organelle DNA restriction sites was very high (0.94), and the corresponding UPGMA trees were very similar, with a slightly better resolution of the ITS tree in the Lolium genus. The time-scale inferred from substitution rates indicated that the period since divergence of the broad-leaved fescues from the fine-leaved fescues was four times as long as that since divergence of the genus Lolium from the former. Among the broad-leaved fescues, meadow fescue was closer to the Lolium group, while F. glaucescens and tall fescue were very closely related. North-African fescues were clustered together and giant fescue was the most differentiated species in this group. Our dataset was merged with ITS sequences recovered from the EMBL database, and the neighbor-joining method was used to draw a phylogenetic tree. In this tree, the tribe Poeae was clearly monophyletic, and more closely related to the Aveneae than to the Triticeae or Bromoideae. The genus Festuca appeared somewhat artificial, since Vulpia myuros and Dactylis glomerata were placed between fine-leaved and broad-leaved fescues.